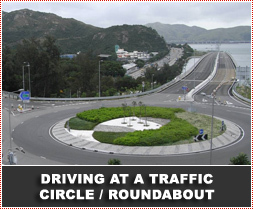 In South Africa we often refer to roundabouts as “traffic circles”. A roundabout is a type of circular intersection that reduces potential conflicts between vehicles and improves the efficiency of the intersection. If you take your time and make sure you are in the correct lane a good distance from the roundabout you can't go far wrong. Slow down as you approach the intersection - You're typically not required to stop. A roundabout is designed to be driven at low speed. Entering and traveling through a roundabout at higher speed is difficult and could be unsafe. As you enter the roundabout, traffic coming from your right has right of way. This means that traffic streaming into the roundabout from the entrance to your right will keep coming as long as no one is coming from their right. These cars may not even slow down as they enter the roundabout, because they have the right of way. You must stop and wait until there is a break in traffic. Watch out for other traffic in the roundabout. Watch out for vehicles already on the roundabout; be aware they may not be signaling correctly or signaling at all. 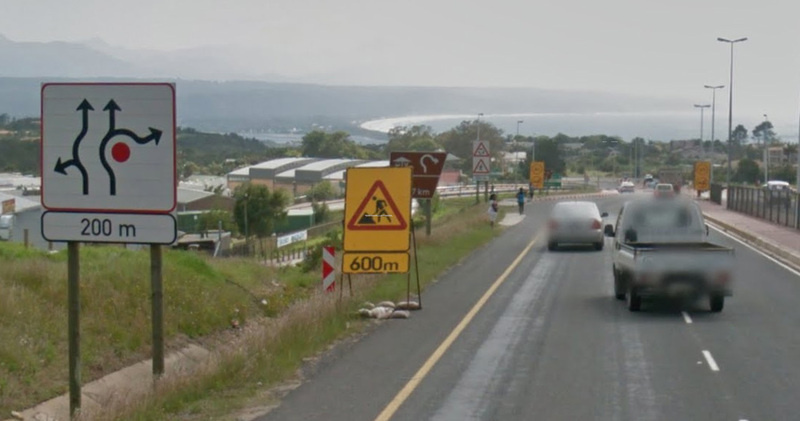 Obey all traffic signs and road markings. If you miss your turn, just go around again. Avoid swerving at the last minute. keep to the left on the roundabout and continue signaling left to leave. Note: The animation shows the vehicle exit the roundabout into the right lane (Lane 2). You should only do this if there is traffic in the nearside lane or you wish to turn right straight after leaving the roundabout. By applying some of this information and sharing this with colleagues and friends we might contribute towards reducing some of the road rage on our roads! Slow down and give way to other vehicles that cross any Yield line before you do. Proceed in a clockwise direction around the painted island, without driving on it. Indicates to the driver of a vehicle approaching a mini circle that he or she shall yield right of way to any vehicle which will cross any yield line at such junction before him or her and which, in the normal course of events, will cross the path of such driver's vehicle and that the driver shall move in a clockwise direction within such junction and attempt not to encroach on the mini-circle. You must obey traffic circle rules at the roundabout. Indicates to the driver of a vehicle that he or she shall move in a clockwise direction at the junction ahead and he or she shall yield right of way to traffic approaching from the right, within the roundabout, where such vehicles are so close as to constitute a danger or potential danger. The official regulations in South Africa leave a lot to be desired when it comes to the finer aspects of driving, and they do not in fact address the situation as described in the sketch provided (below). 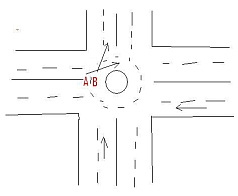 It is not clear from this sketch which of the two arrows in the approaching roads represents which of the vehicles. - Then he entered the circle from the wrong lane if he intended using the circle to turn back and drive back on the same dual-carriage road to the right. He should have been in the RH lane when entering the circle. - A was entered the circle from the correct lane but somehow got into the outside lane once in the circle, which is wrong for the exit he wished to take. - Also, A should have waited for B before entering the circle, and would therefore not have ended up in this situation. Whichever way it happened, either or both of the vehicles ended up in the wrong lane within the circle and that is the cause of the problem. Of course, this assumes a fairly small roundabout. Have said that, when one gets in a fix such as this the norm would be for the vehicle that is ahead of the other vehicle to move forward and for the vehicle behind to allow it to get out of the way so that it can exit the circle. However, as both A and B are alongside each other, the Calgary rule would seem the most appropriate. At the end of the day, no vehicle in a traffic circle should obstruct another's line of travel. So if there were any doubt at all, B should go around the island another time (or even two) and move into the LH lane when it is safe to do so, and then exit from that outer lane when it is safe to do so. (Of course, he would check mirrors and blind spots first, then if it is safe, use the left indicator, and all that other "good K53 stuff".